A private and secure ocean side estate offering all amenities including both Pacific and mountain views. 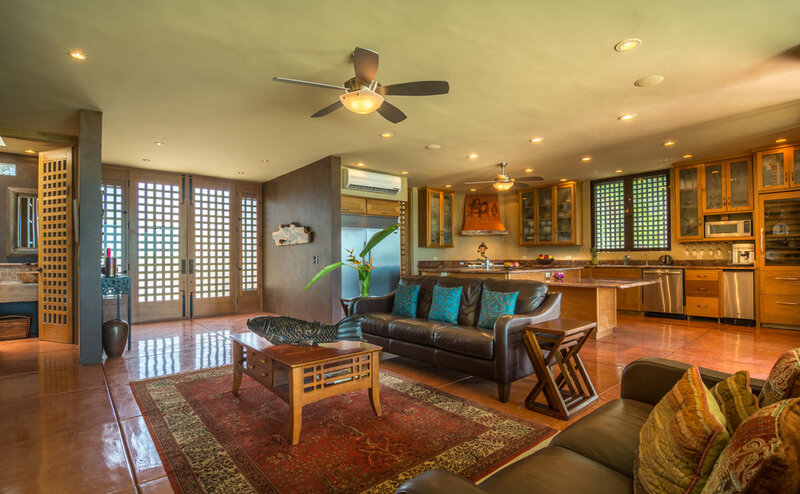 This spacious, architecturally designed one and a half acre paradise presents an elegant mix of smartly designed living spaces, private guest casitas and tropical gardens. Upon entering this magical enclave you are greeted by a vibrant palm oasis suffused with sea breezes carrying the sent of climbing star jasmine. Watch whales, ocean sunsets and mountain moon risings from the viewing towers. Enjoy a morning swim in the solar heated 75 foot salt water lap pool… or spend an evening with friends relaxing in the Jacuzzi. A short stroll down a shaded path, and over the dune, voila your feet are in the Pacific Ocean. 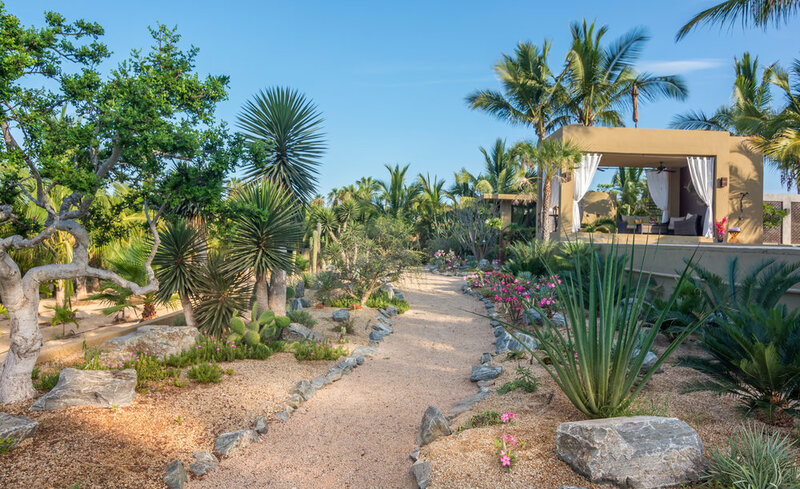 The gardens include a selection of drought tolerant, desert and exotic tropical trees and plants. The property is a fully walled and gated 1½ acres, (6,061.431 m2). As you pass through the hand crafted wooden doors you know you’ve entered a thoughtful and welcoming home. This estate offers an entertainment area, living room, powder room, large guest bedroom and an office with private bath and patio. Hand crafted mahogany shelves and cabinetry are found throughout the home. The generous chef friendly kitchen offers granite counter tops, a walk-in pantry, high-end stainless steel appliances, dishwasher, and a Sub Zero wine cabinet. Four separate A/C units allow for tailored temperature control. Enjoy meals or drinks indoors or out on any of the many patios. The home shines with quality finishes and fine details. Decorative steel door and window coverings slide easily into position for filtered shade and privacy or for security and storm protection when away. Offers a large bedroom with custom closets, dressing area with built in dressers. Master bath includes double sinks and a shower featuring double shower heads, a bidet and an automatically timed bath towel warmer. A convenient pantry includes washer and dryer. 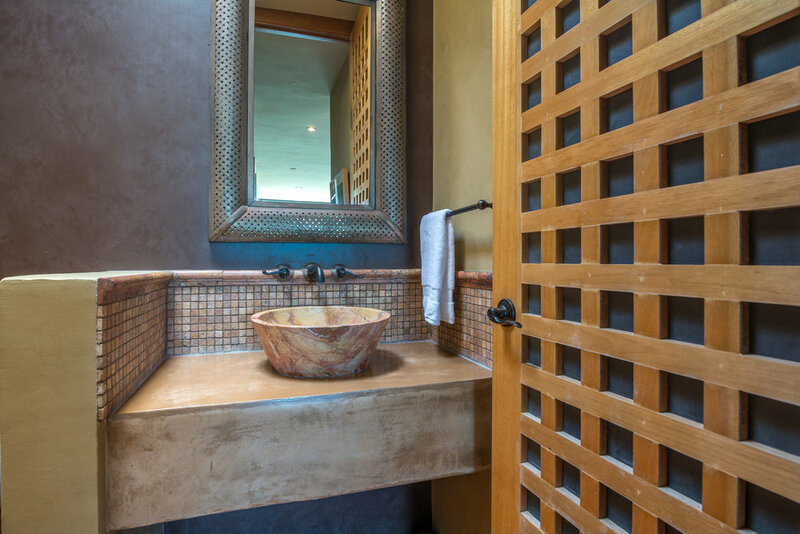 Just off the bathroom is a private patio featuring a flower garden and outdoor beach shower. Spiral stairs lead up to the ocean view roof top, perfect for sun bathing, yoga, or evening star gazing. Wi-Fi, A/C and Sat TV in each building. All sliding glass doors and windows are dual pane tempered glass. Palm shaded outdoor barbecue area offers it’s own dining table just steps away from the spa, pool, and fire pit. Buildings are solidly made with concrete block. Main building pillars were built with ¾ inch rebar to allow for a possible second floor. Pool has a new energy efficient variable speed pump and a low maintenance filter system. There are 2 septic tanks and 4 hot water heaters. Offers a bedroom with mini kitchenette, large dressing area, custom closets with washer and dryer and built in dressers. Private patio and balcony over-looks the desert garden and coco palm grove. The fully enclosed garage has secure parking for 3 vehicles. 10,000 liter municipal water cistern, carbon water filtration, UV filter and water softener. Automatic drip irrigation with a 13,000 liter agricultural, (canal) water cistern for garden use. Palm grove has an additional 17,000 liter agricultural/canal water cistern and separate automatic drip irrigation. The lush grove includes hundreds of Coconut and other exotic palm trees and was designed to allow for further expansion with additional casitas or a second home while maintaining the privacy of the upper compound. Property comes furnished. (List upon request).